Neurotransmitters are chemicals that relay signals between nerve cells, allowing proper communication between the brain and nervous system. This system of communication allows for proper neurological function and adequate hormonal function. Every neurotransmitter has several subtypes. It is the presence or absence of certain sub-types that causes a cascade of specific chemical reactions in the postsynaptic neuron. 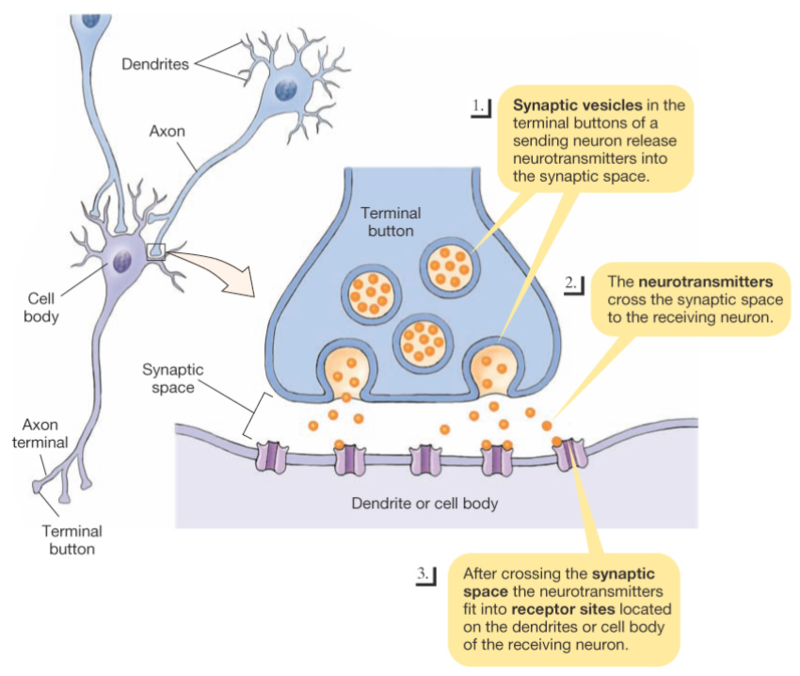 These reactions result in the excitation or inhibition of this neuron (nerve cell). 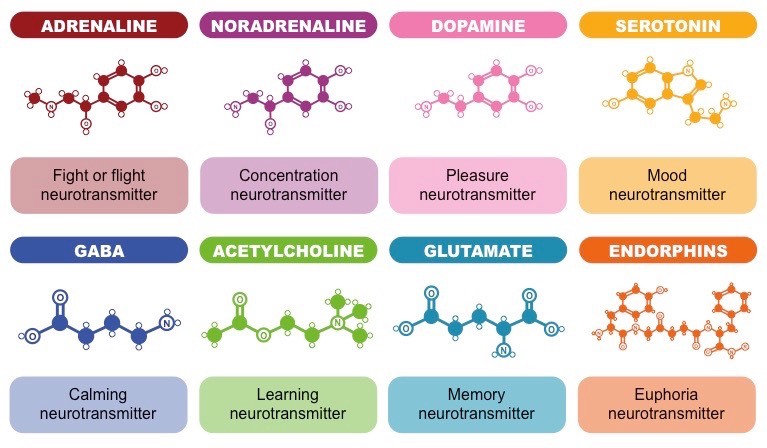 There are many neurotransmitters, but they can all be categorized as either inhibitory or excitatory chemicals. Apart from acetylcholine, they all also belong to the family of amines or amino acids. Acetylcholine is a widely distributed excitatory neurotransmitter that triggers muscle contraction and stimulates the excretion of certain hormones. In the central nervous system, it is involved in wakefulness, attentiveness, anger, aggression, sexuality, and thirst, among other things. Dopamine is an inhibitory neurotransmitter involved in controlling movement and posture. It also helps modulate mood. Producing too much dopamine can make one too intense, compulsive, and driven. Overproduction of dopamine can also lead to violent behavior. Physical signs of dopamine deficiency will be fatigue, sleeping long hours and still not feeling rested, a wandering mind, difficulty making decisions, caffeine cravings, and sexual dysfunction. Serotonin contributes to various functions, such as regulating body temperature, sleep, mood, appetite, and pain. Early signs of a serotonin deficiency include loss of enthusiasm, depression, insomnia, weight gain, and lack of productivity. Increased levels of serotonin can cause nervousness, paranoia, depression, and anger. GABA (gamma-aminobutyric acid) is an inhibitory neurotransmitter that is very widely distributed in the neurons of the cortex. GABA contributes to motor control, vision, and many other cortical functions. It also helps regulate anxiety. Early signs of GABA deficiency include feeling anxious, nervous, or irritable. One may start to feel overwhelmed and stressed out as well. Other symptoms can include allergies, light-headedness, and muscle aches. The most common symptoms associated with neurotransmitter imbalances are fatigue, depression, sleep disorders, anxiety, hypertension, diabetes, hypoglycemia, chronic pain, and difficulty concentrating. Additionally, there is increasing research relating neurotransmitter imbalances to ADD (Attention Deficit Disorder) and ADHD (Attention Deficit Hyperactivity Disorder). There are many factors that can cause imbalances in the neurotransmitters; however, the most common are prolonged periods of stress and nutritional deficiencies. Other factors such as toxicity and some medications can also disrupt the balance of neurotransmitters. In order to correct an imbalance, we must first have a baseline measurement. Our office utilizes a combination Saliva & Urine Test to measure inhibitory neurotransmitters, excitatory neurotransmitters, and adrenal hormones. The effectiveness of this type of testing is well documented (see the article attached below). Since neurotransmitters are derived from amino acids, it is often important to evaluate amino acids as well. Our office offers complete neurotransmitter testing and will create a nutritional and supplementation regimen tailored to your specific needs in order to correct any present neurotransmitter imbalances.